Classifying your training into zones is vital for effective training. Your body responds to different training stimuli in different ways. Your workout needs to be adjusted to the zones that you are going to train in. What training zones are in use? Active recovery: Training in this zone will improve your recovery time. After a hard session your legs might be hurting and you are out of breath. Instead of just stopping completely you might intuitively spin your legs in a low gear to get the lactate out of the system. This improves the blood stream to the muscles and you will sooner be ready for the next session. This does not only help directly after a hard session. Even the day after a competition it might be beneficial to move your body to recover faster. 1. The metabolism mostly runs on fats. Even the leanest athlete has enough body fat to fuel hours of training in this zone. 2. Lactate can be broken down faster than it is created. 3. The load on the body is much smaller than in higher zones. There are less micro injuries in your muscles and less sore muscles. Even after hours of training you will be able to train again the next day. Tempo: It is harder to keep the speed over a long time in this zone compared to the endurance zone. You get tired faster. You won’t be completely out of breath but conversations might already be difficult. 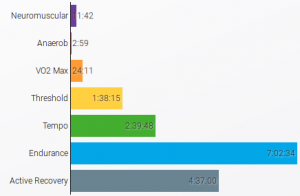 Regeneration takes longer compared to training in the endurance zone. The metabolism uses more carbohydrates than fats. Threshold: When training in this zone your body creates about the same amount of lactate as it can break down. Your heart rate will be about 5-10% below your maximum. When measuring power you’ll be in the area of your FTP. VO2 max: This is the highest zone when training in heart rate zones. You are close to your max heart rate. You will not be able to train more than 15 consecutive minutes in this zone. On the bike this zone is about 5-20% above your FTP. What does VO2 max mean? It is the maximum oxygen intake in milli litre per minute per kg body weight (ml O2/min/kg). It is an indicator for endurance fitness. The average population has a VO2 max of around 40 ml/kg/min while world class athletes might have a VO2 max of more than 90 ml/kg/min. Anaerob: The next two zones only exist in watt based training. The reason is that the heart rate has an upper limit. Your watts can spike extremely high for a few seconds. This zone is for power spikes of up to 150% of your FTP. You can hold this for about a minute. Neuromuscular: A few seconds of your max power. Peak values can go up to 1500W.